The Mt. 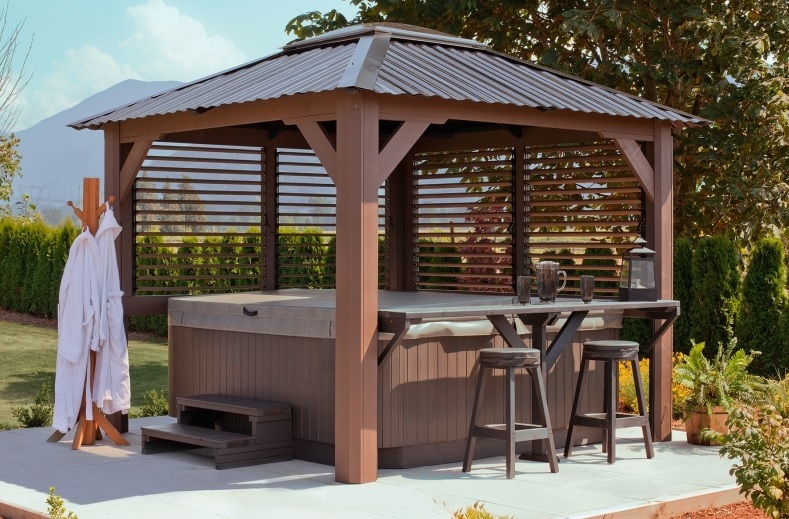 Alta Visscher gazebo (9′ x 9′) turns your spa into your exclusive entertainment centre. This model incorporates a 42″ x 42″ skylight dome in a trusted Visscher roof structure. Sturdy posts and bar accent your property nicely. Adjust the louvers to suit your level of exposure to the elements as you relax beneath this structure. 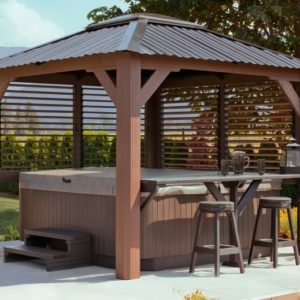 The Jasper Visscher gazebo is built with outdoor living in mind, combined with the protection of being fully-enclosed. Huge windows let the breeze in, and screens keep the bugs out. 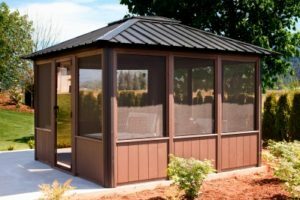 This model has lots of features with a mid-size footprint (11 x 14) that suits almost any yard. Include the vinyl window kit add-on, so you can manage your climate, no matter what it’s like outside. Lightweight and easy to handle, these windows install with the turn of a clip. Include a bay kit that will add square footage to the interior, as well as adding a stylish look that will set your enclosure apart from the neighbourhood. Contact us about pricing and other available models.